I know I’m late to the idea but my New Year’s resolution was to not buy any more plastic toys after getting fed up with the playroom being polluted with the stuff! It was a big relief to make that decision but it also means I have to carefully consider any new purchases as non-plastic toys are not only harder to find but tend to cost a tad more. 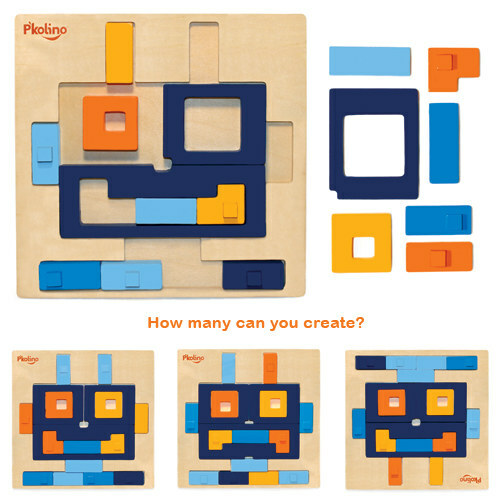 P’kolino have introduced these great new multi-solution wood puzzles. Choose from the round and curved shapes of the bug or the square and rectangular ones of the robot. Both look great and with a variety of ways of putting them together, will really get your child’s mind working. We love this American-based company and have featured their wonderful products before. We’re waiting patiently for the day when we can reveal there’s finally an Australian stockist for all that non-plastic loveliness! Until that day comes, you can order P’Kolino products through 2Modern who ship internationally. The puzzles, expected to be in stock soon, cost US$19.99 and are suitable for children aged two years and older.